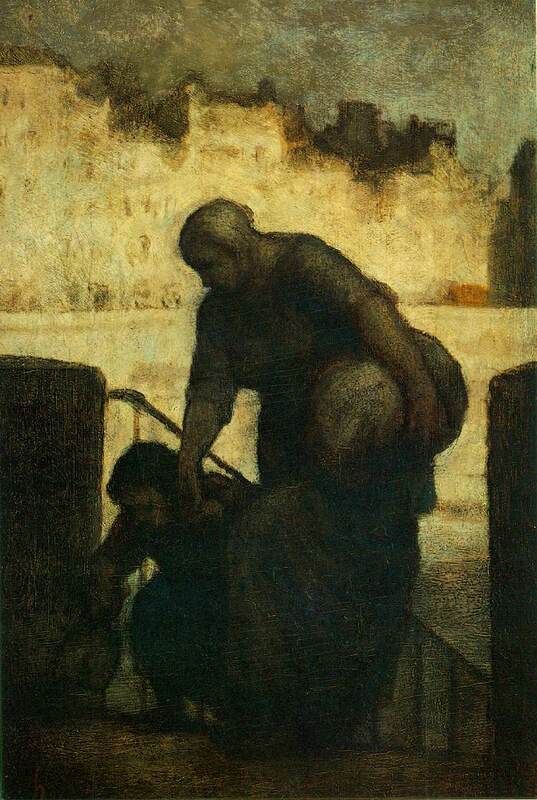 Daumier, Honoré (1808-79). French caricaturist, painter, and sculptor. In his lifetime he was known chiefly as a political and social satirist, but since his death recognition of his qualities as a painter has grown. Undated (150 Kb); Oil on wood, 11 x 14 in; The Phillips Collection, Washington, D.C.
c. 1847-50 (130 Kb); Oil on wood, 32.6 x 24.8 cm (12 7/8 x 9 3/4 in); The National Gallery of Art, Washington, D.C.
c. 1860 (190 Kb); Oil on canvas, 87.6 x 113 cm (34 1/2 x 44 1/2 in); The Phillips Collection, Washington, D.C. In 1830, after learning the still fairly new process of lithography, he began to contribute political cartoons to the anti-government weekly Caricature . He was an ardant Republican and was sentenced to six months' imprisonment in 1832 for his attacks on Louis-Philippe, whom he represented as `Gargantua swallowing bags of gold extorted from the people'. 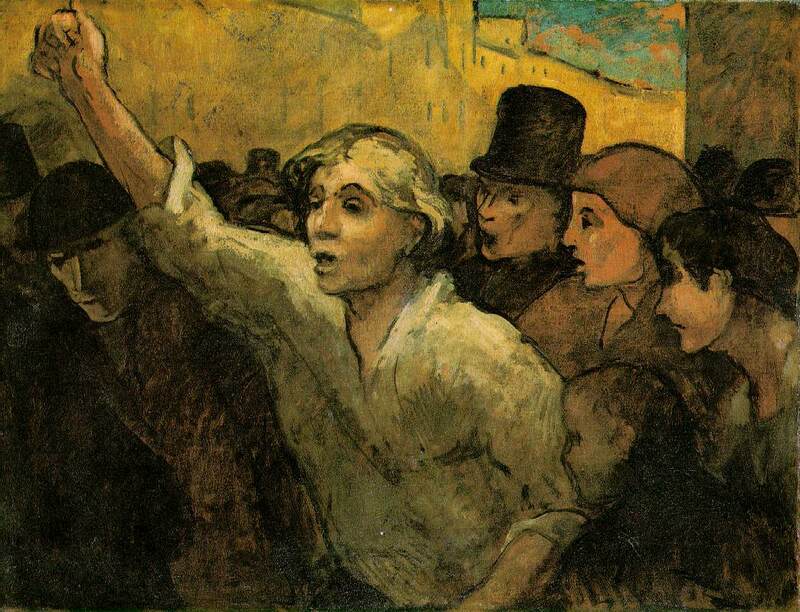 On the suppression of political satire in 1835 he began to work for Charivari and turned to satire of social life, but at the time of the 1848 revolution he returned to political subjects. He is said to have made more than 4,000 lithographs, wishing each time that the one he had just made could be his last. 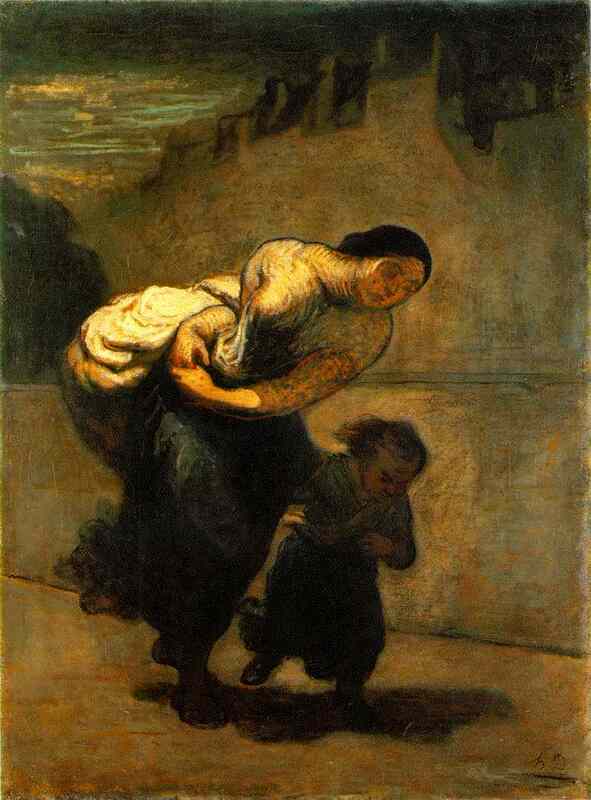 In the last years of his life he was almost blind and was saved from destitution by Corot. 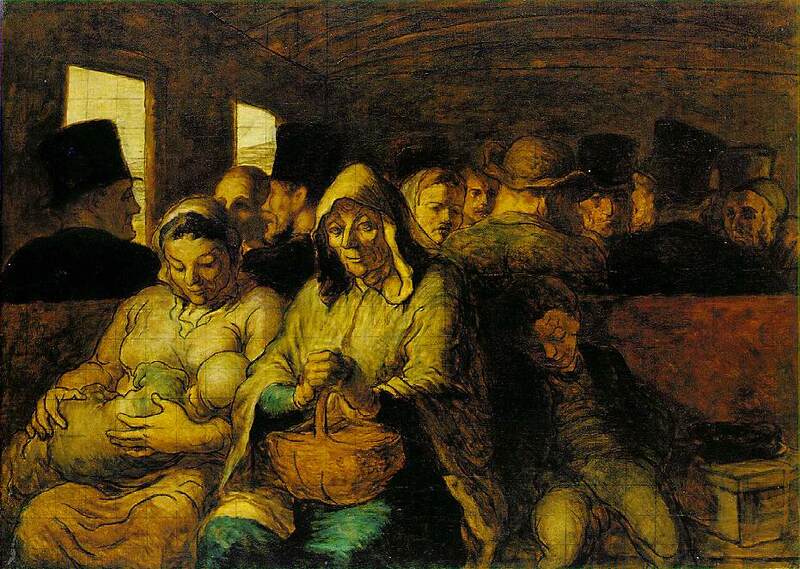 Daumier's paintings were probably done for the most part fairly late in his career. Although he was accepted four times by the Salon, he never exhibited his paintings otherwise and they remained practically unknown up to the time of an exhibition held at Durand-Ruel's gallery in 1878, the year of his death. The paintings are in the main a documentation of contemporary life and manners with satirical overtones, although he also did a number featuring Don Quixote as a larger-than-life hero. His technique was remarkably broad and free. As a sculptor he specialized in caricature heads and figures, and these too are in a very spontaneous style. In particular he created the memorable figure of `Ratapoil' (meaning `skinned rat'), who embodied the sinister agents of the government of Louis-Philippe. A similar political type in his graphic art was `Robert Macaire', who personified the unscrupulous profiteer and swindler. 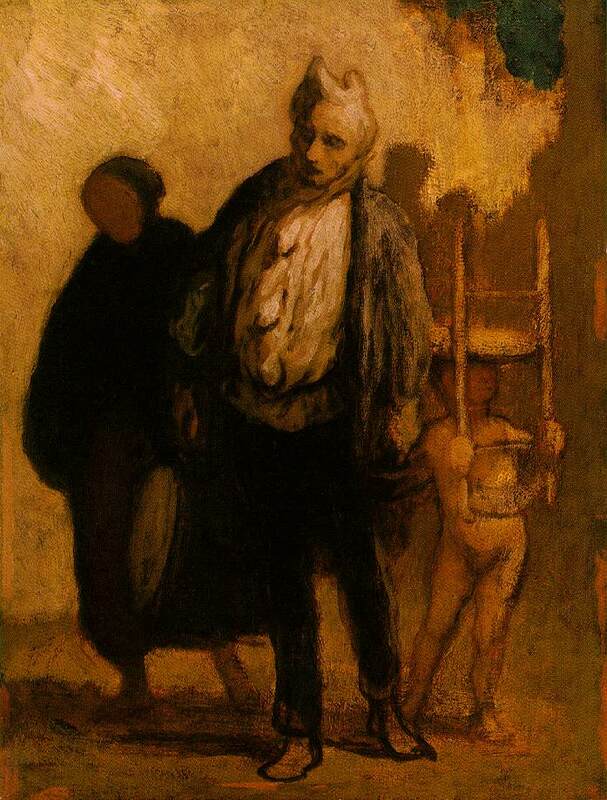 In the directness of his vision and the lack of sentimentality with which he depicts current social life Daumier belongs to the Realist school of which Courbet was the chief representative. As a caricaturist he stands head and shoulders above all others of the 19th-century. He had the gift of expressing the whole character of a man through physiognomy, and the essence of his satire lay in his power to interpret mental folly in terms of physical absurdity. 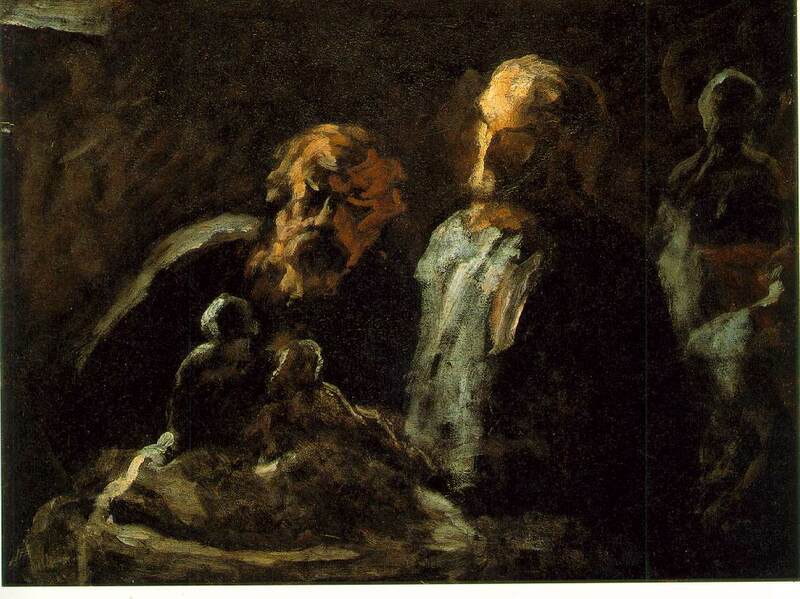 Although he never made a commercial success of his art, he was appreciated by the discriminating and numbered among his friends and admirers Delacroix, Corot, Forain, and Baudelaire. Degas was among the artists who collected his works.